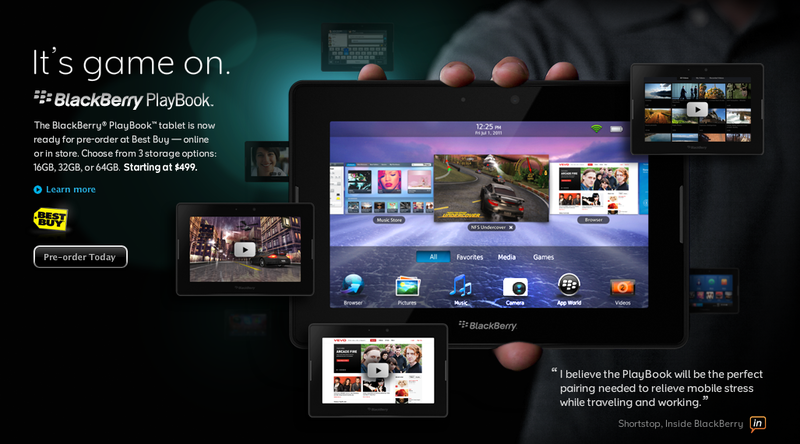 RIM has officially confirmed a few more details for its BlackBerry Playbook tablet, including the first official price information. While there’s still no official release date for the device, it will be available at 20,000 retail outlets in the U.S. and Canada and the US Best Buy website already has the 16GB base model up for pre-order at 499 USD. Meanwhile, Best Buy’s Canadian site is pricing three different models as follows: 16GB for 499.99 Canadian Dollars, 32GB for 599.99 and 64GB for $699.99. Although there’s no official release date, the devices are shown as being set to arrive at Best Buy’s warehouses on 19 April, indicating that a release around that date is likely. Ever since it first announced the Playbook, BlackBerry has drip-fed us information and we’re almost there now. So RIM, when do we get our hands on this thing? UPDATE: As a reader comments below, Best Buy’s press release states a 19 April release date. Will that hold? We don’t have long to find out. Read next: Inception meets the Zune. Ouch.